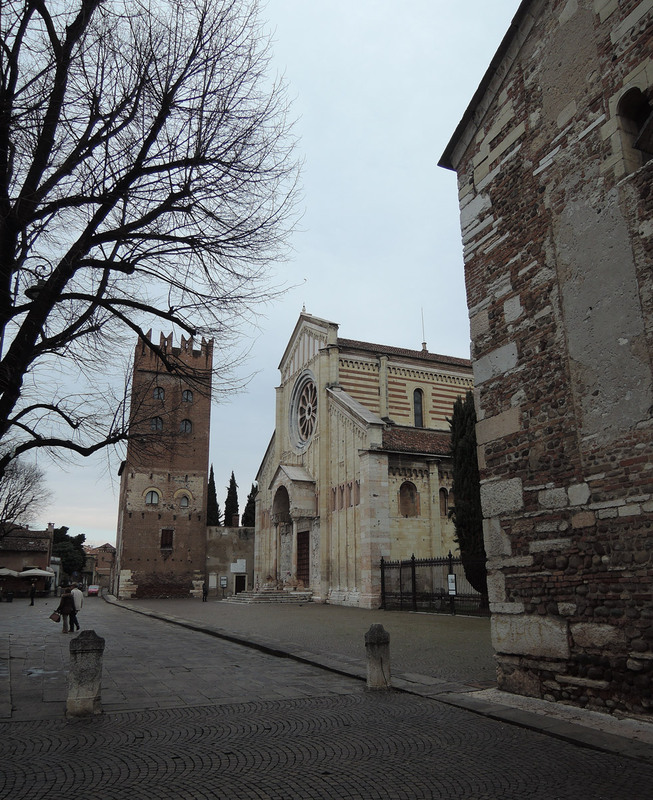 Saint Zeno of Verona [sahn DZEH-noh]is a beautiful Basilica. 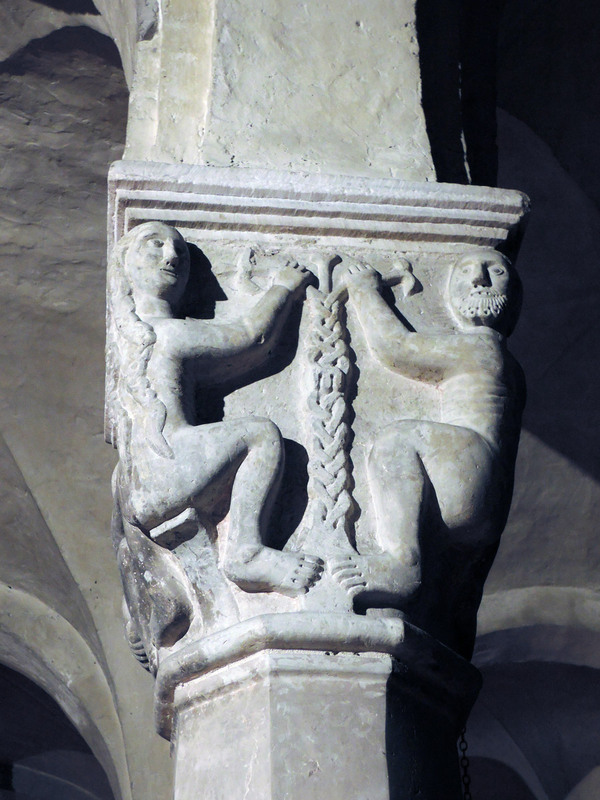 It is one of the masterpieces of the Romanesque architecture in Italy. 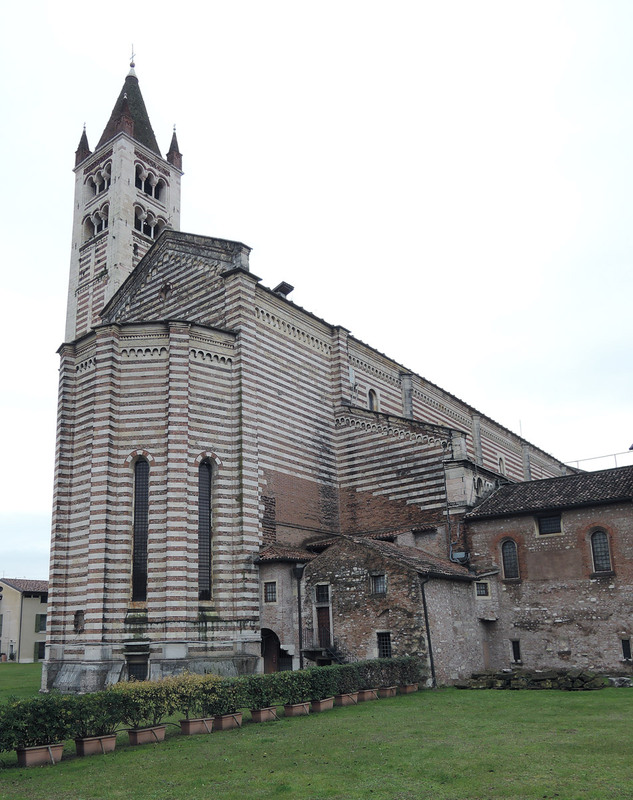 The construction began in the IV century, and they completed it in 1389. According to a legend Romeo and Juliet got married in its crypt. The Rose Window is surrounded by six statues depicting a man who falls and then rises again. It is therefore nicknamed Wheel of Fortune. The Prothyrum has two “guard lions”. 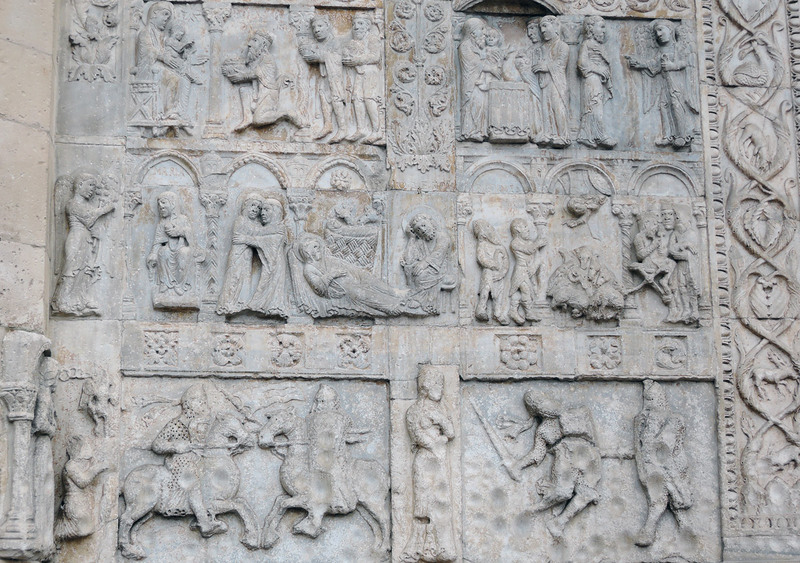 To the sides are 18 reliefs (XII century). To the left those of Master William (Episodes New Testament and duels), to the right those of Master Nicholas (Episodes of the Old Testament and the Legend of Theodoric, king of the Ostrogoths). The Pediment is decorated with a Last Judgement graffiti. It is impossible to see it from the bottom. It was in fact noticed only in 1905. 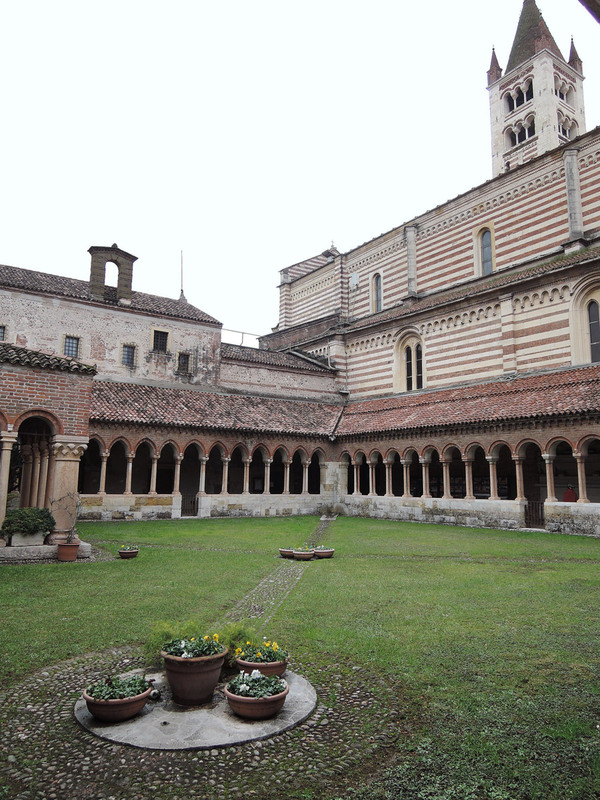 In the cloister is now possible to observe a reproduction. The Portal with 48 bronze panels. The panels do not belong to the same period. The first are of German origin. The others belong to the school of Verona. They were completed all by 1118. During a rearrangement the linearity of their story went lost. They depict stories of the Old and New Testament plus 4 stories of Saint Zeno. 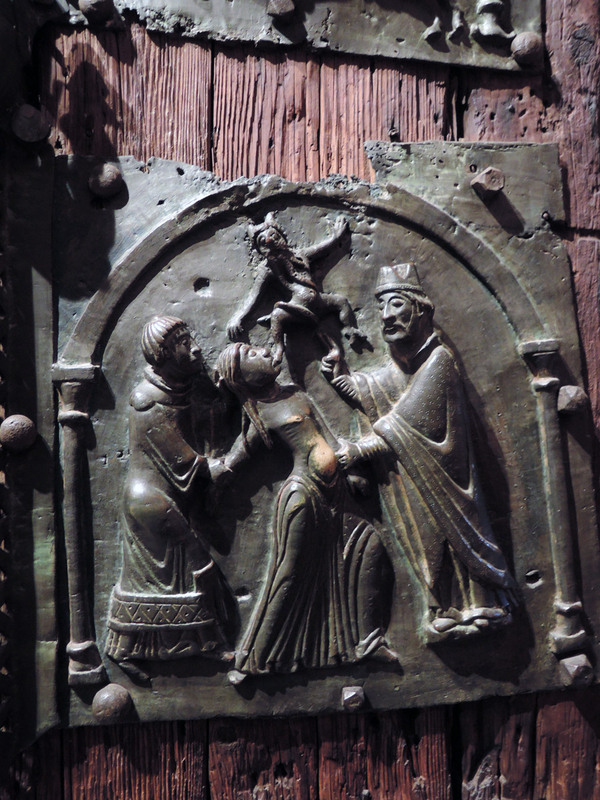 In addition to the regular tiles, there are smaller figures on both sides of the door. On the right there are 7 saints and historical figures. On the left 3 Emperors and the 3 theological virtues: faith, hope and charity. Two figures were stolen in 1909 and then kept for many years at the Kaiser Friedrich Museum in Berlin. They were sadly destroyed during an air raid during the war. 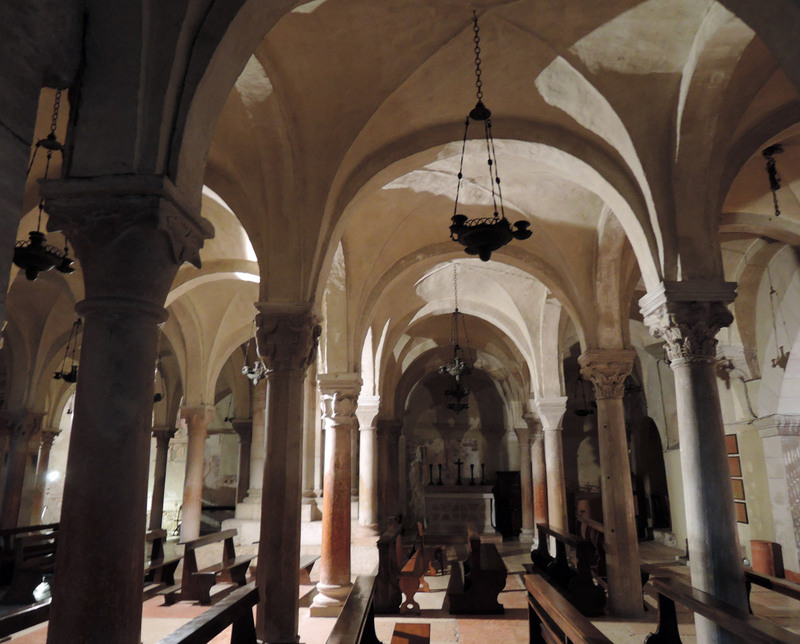 The Crypt (X century) has 9 naves and 49 columns, each with a different capital. Here is kept the sarcophagus of Saint Zeno, with his face covered by a silver mask. In the Presbytery there is Andrea Mantegna’s masterpiece. It is important because it is the first Renaissance altarpiece painted in northern Italy and this is due to Mantegna’s use of perspective. It depicts the Virgin with baby Jesus and Saints (from the left: St. Peter, St. Paul, St. John the Evangelist, St. Zeno, Saint Benedict, St. Lawrence, St. Gregory and St. John the Baptist). In 1797, during the Napoleonic suppressions, the altarpiece was requisitioned and sent to Paris in the Napoleon Museum, the future Louvre. During refunds of the Restoration (1815), it was recovered, but the 3 predella parts remained in France (Agony in the Garden, Tours, Musée des Beaux-Arts; Crucifixion, Paris, Musée du Louvre; Resurrection of Christ, Tours, Musée des Beaux-Arts.). The ones you can here admire are copies. Did you know that…Along the right wall, soon after climbing the stairs, you can admire some frescoes in which you will definitely notice some strange inscriptions. For example a writing says “febraio 1695 fu il teremoto grande” (February 1695 was the big earthquake). 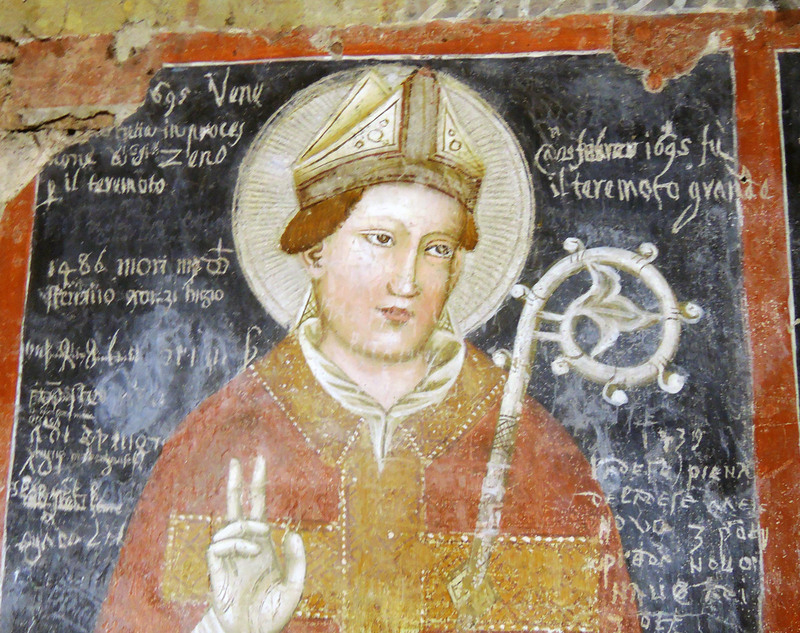 Probably a devotee wanted to commemorate this event and to thank Saint Zeno for surviving. The day I went there, the Basilica there were not many people inside. Maybe because the day was a freezing winter day or maybe because it’s a little off the beaten path. It took me 15-20 minutes of pleasant walk along the river Adige (you can spot the church tower from the promenade) to arrive. The square in which the church stands is a very quiet spot. There are some restaurants on left side. It must be very pleasant to have lunch there in the warm season. I was very impressed to see, at the sides of the portal, the reliefs with chivalry images, other than religious ones. The Basilica is not gloomy at all and contains many interesting pieces. There’s a fee to pay to enter (2,50€). This fee is a contribution to ensure the opening, the presence of personnel and ordinary maintenance of the church. And in fact the church is very clean, it provides you with an informative leaflet and there was a nice girl ready to help the visitors out. The courtyard is charming and it’s worth a stop. The things I enjoyed the most were the crypt (a forest of columns with different capitals), the bronze portal (it is fabulous, some panels are really peculiar. For example the one with exorcism of a possessed woman. 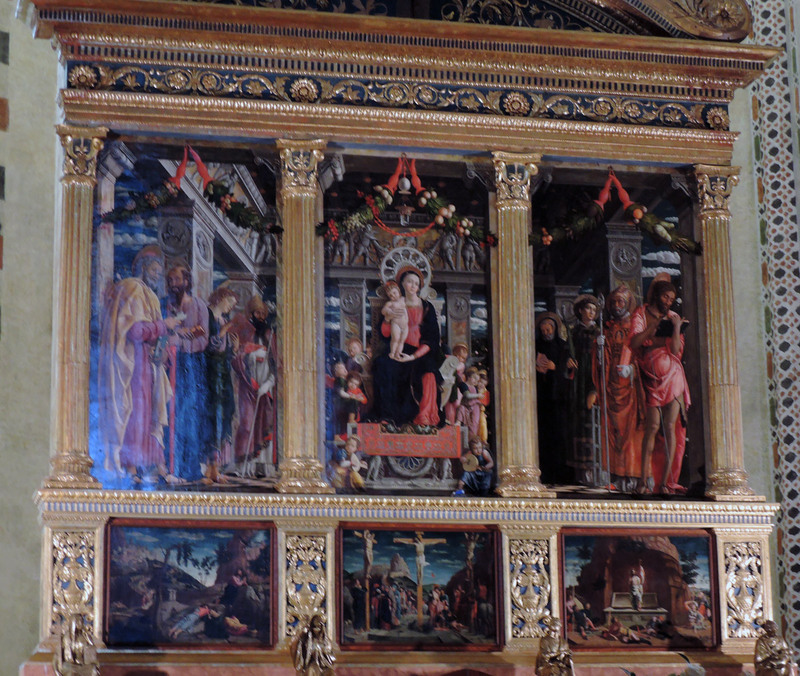 Unfortunately there are no explanations about the panels), the Mantegna masterpiece (it is a real shame not being able to admire it more closely. From the actual distance you can not fully appreciate it. My photo is in fact very very bad) and the inscriptions on the frescoes. I had never seen something like that before.